The v2.0 firmware for the MCX8000 introduces the much anticipated Engine Prime support. This article will walk through the new features and improvements in the MCX8000 V2.0 firmware, and show you step-by-step on how to install this game-changing update. How do I install firmware v2.0 on my MCX8000? What new features have been added to the MCX8000 with the v2.0 update? Can I use my existing Engine Prime Libraries with the MCX8000? How do I turn on the MCX8000 compatibility in the Engine Prime software? What does the MCX8000 Compatibility column in my library mean? How do I export my database to be compatible with the MCX8000? 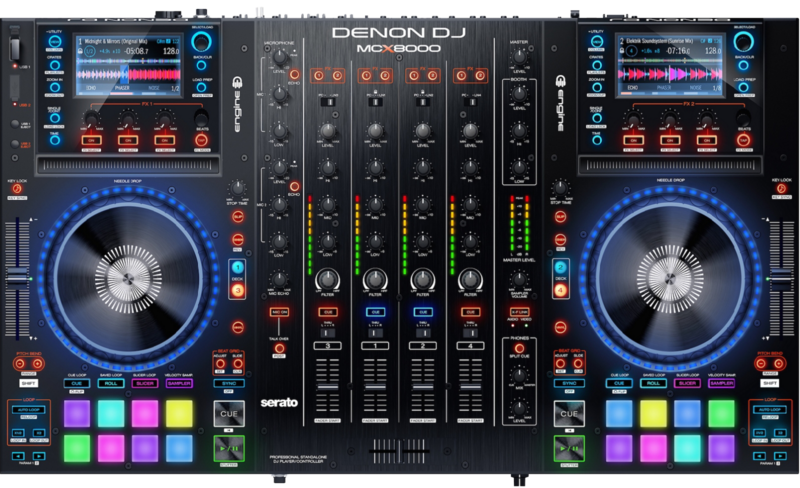 Any MCX8000/Engine Prime user can find the firmware and software updates right on the respective product pages (under the Downloads section), as well as under their product registration in their Denon DJ account. Do I need to update both the firmware and software? Yes. The MCX8000 compatibility with the Engine Prime software and Engine Prime libraries is a new feature added in the MCX8000 v2.0 firmware, and Engine Prime software v1.2.1, so both the firmware and software will need to be updated to enjoy full access to all of the new features. Update instructions for the MCX8000 can be found in the firmware update download. The main new feature to the MCX8000 is official support for the Engine Prime software, and Engine Prime prepared USB drives. You can now take advantage of the updated features with the Engine Prime software with your MCX8000 for a true standalone experience. You have the option of using your previously prepared Engine Prime drives as is, or you can use the MCX8000 specific format for optimal performance. With this update, you now have extended control over how the microphone inputs work with the MCX8000. Yes. The MCX8000 wit accept thumb drives that you have already prepared using the Engine Prime software. You can connect the same drive that you do to your SC5000 directly to the MCX8000 for usage. Once you have installed Engine Prime 1.2.1 and MCX800 firmware v2.0, go to the Engine Prime preferences and choose the Library tab. Find the option Enable MCX8000 Compatibility and select ON. When you're ready to export your database, click the Export to MCX8000 button at the bottom of the window. This will compile your music into an MCX8000-friendly format so you can navigate your library at the same Engine 1.5 speeds you are accustomed to. Note: this is a one-way export. Any changes made on the MCX8000 hardware cannot be reimported or synchronized back into Engine Prime.